Hello, Phillies fans. Generally, I use this space to talk about some weird statistical quirk or outlier that involves one of our beloved phightins. I started down that usual path, but stopped when I saw that history was made this week. Dubious history, but history nonetheless. Chris Davis is hitless in 53 straight at-bats, which is the new all-time record for non-pitchers. Of course, you can’t make history without getting a little lucky (or a little unlucky). But how much of his current streak can we attribute to bad luck vs. bad skill? Let’s dig into this to see how he found himself in this undesirable place. Of these 53 at-bats, 30 of them were strikeouts. Strikeouts are notoriously bad for batting average – as a whole, players have hit .000 in at-bats ending in a strikeout. So right off the top, you’re lopping off 56.6% of his at-bats – 56.6% of his chances to get a hit. Not all strikeouts are the batter’s fault – sometimes you (if you’re a ballplayer) find yourself (again, only talking to ballplayers here) the victim of a bad call, and are simply left shaking your (ballplayer) head as you walk (with your ballplayer feet) to the dugout. 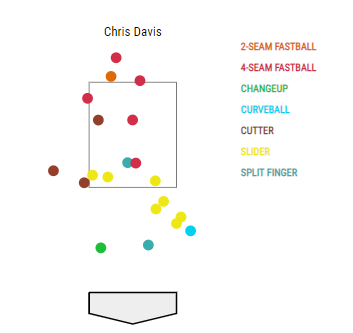 Let’s examine Davis’s 10 K’s where he was caught looking, to see how many times he was robbed. None. None times robbed. Those are all pretty clearly strikes. No head shake-inducing calls here. Just for good measure, here’s a chart of his 20 strikeouts swinging. Not that there’s ever been an unfair swinging strikeout – it’s just that this chart is kind of wild. Inside the zone. Out of the zone. All kinds of pitches – he swung through all of them, extending his futility streak one swing at a time. Moving on from strikeouts, let’s start with a fun fact. In 2019, 23 players have at least 16 hits. That’s pretty good! Chris Davis has only put 16 balls in play. That’s pretty bad! To add some more perspective – since September 14th, Davis has 24 batted balls (including the double that preceded this streak). Adrian Beltre has 38 over the same time span. Now, Beltre is a fantastic ballplayer, so maybe that comparison isn’t fair… Then again, Beltre is also retired. So maybe it is. 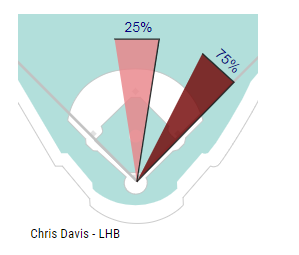 Chris Davis has put so few balls in play that his infield slice chart looks like somebody got hungry and ate a couple slices. Batted balls are the only kind of balls that can result in hits. Not that all batted balls are created equal – a line drive is more likely to be a hit than a soft dribbler. Statcast’s xBA metric describes how likely a batted ball is to be a hit. This can be used to find plays where the batter was robbed by some brilliant defense (such as this, xBA of 0.970) or where a hitter got lucky (such as this, xBA of 0.010). 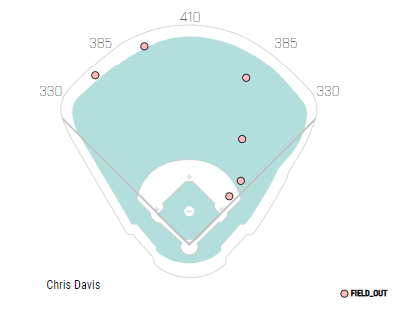 Looking at Davis’s batted balls, 6 of the 23 had an xBA more than 0.500. Doing some simple math, there’s about a 1.5% chance that Davis would end up with 0 hits in those 6 at-bats. A spray chart reveals why this is misleading. Look at all those pulled balls. 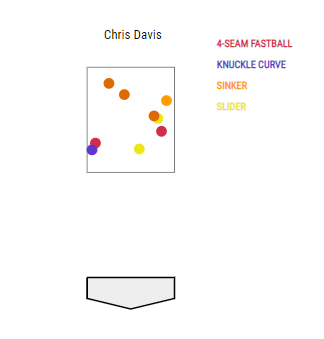 Davis is extemely shiftable – he’s seen 165 pitches this year, and been shifted on in 162 out of the 165. That 98.2% ranks third in baseball, behind only Joey Gallo (I expected to see this name) and Curtis Granderson (I did NOT expect to see this name). The Phillies had bad luck with shifts last year, but as Davis proves, the shift works. So he strikes out a lot, and when he puts the ball in play its either weakly hit or pulled into the shift. Davis is on pace to finish the season with 0 hits (heh stats humor). After looking into it further, it’s not hard to see why. Standout Hitter: Rhys Hoskins. Four homers. 5 walks. Only 6 strikeouts. The Beast keeps on rolling – and he’s looking great behind Harper. Standout Pitcher: Zach Eflin. Yes. Again. Eflin followed up his solid debut with 7 innings of 1-run ball. With other members of the staff faltering, Eflin has done a great job of picking up the slack. Sit-Down Hitter: Cesar Hernandez. His xBA shows he’s been one of the least lucky hitters in baseball, which is good because the results have been u-g-l-y. 21 PA, 2 singles, and 3 walks in the past week is not enough to get it done. One week doesn’t make or break a player, but this will be something to watch, especially with Kingery waiting in the wings. Sit-Down Pitcher: Edubray Ramos. 27.00 ERA. 1 blown save. Enough said. Billy Hamilton scored from second on a sac fly. I think he may even be fast enough to beat the freeze. Since I used the main part of this post to talk about something non-Phillies, I’m going to use this part to post something Phillies related. This team is fun. After being linked to this video 3 times, I finally watched it. It’s awesome for 2 reasons – it’s baseball, and the background music is all from Chrono Trigger (the greatest game of all time). Baseball players are very good at what they do. Unless something happens that slightly confuses them. Then they are rendered completely helpless, as can be seen in one of the weirder double plays I’ve ever seen. 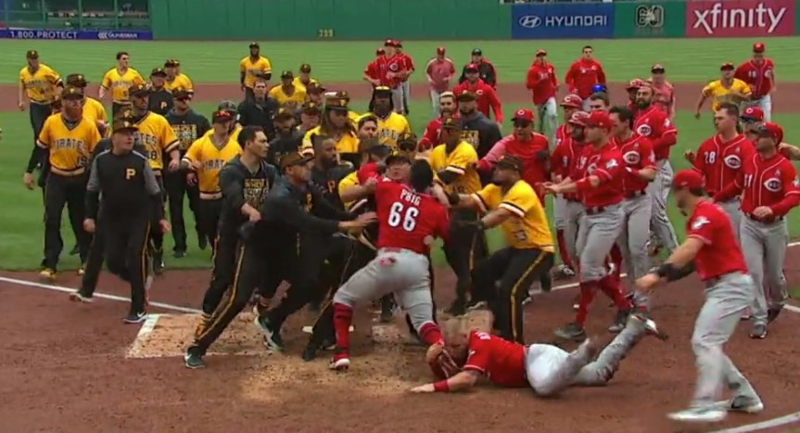 Benches cleared in Reds/Pirates game on April 7th, during which it appears Puig planned on fighting the entire Pirates roster by himself. We expected the NL East to be mostly tight and the Marlins, and well… so far, it’s been that. The Phillies are 7-4. Go Phillies.